This page is about the modern city. For the World Heritage Native American site located about 10 miles (16 km) to the northeast, see Cahokia. For the extinct Native American tribe unrelated to the builders of the Cahokia Mounds, see Cahokia (tribe). Cahokia is a village in St. Clair County, Illinois, United States. It is part of Greater St. Louis metropolitan area. As of the 2010 census, the village had a population of 15,241, a decline from 16,391 in 2000. The name is a reference to one of the clans of the historic Illini confederacy, who were encountered by early French explorers to the region. It was founded as a French Canadian mission in 1696. Early European settlers also named Cahokia Mounds after the Illini. This is an extensive prehistoric Mississippian culture urban complex located to the north in present-day Collinsville in Madison County. It is a UNESCO World Heritage Site and a State Historic Park. Cahokia had become the center of a large area for trading Indian goods and furs. The village had about 3,000 inhabitants and a thriving business district. The nearby town of Kaskaskia on the Mississippi became the region’s leading shipping port, and Fort de Chartres became a military and governmental command center. The 50-mile (80 km) area of land between the two cities was cultivated by farming settlers, known as habitants, whose main crop was wheat. 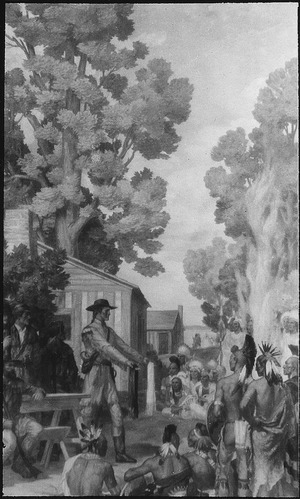 As the area expanded, the relationship between the settlers and the Indians continued to be peaceful. Settlers were mostly Canadien migrants whose families had been in North America for a while. In the following years, Cahokia suffered, mainly from the French loss in the French and Indian War in 1763. Defeated by Great Britain in what was an extension of the Seven Years' War in Europe, the French were forced to cede large parts of the Illinois Country to the victors. Many Cahokians fled in fear of the British, or because they wanted to live in a Catholic province, to Louisiana, where they founded new Canadien villages on the west of the Mississippi River, such as St. Louis, and Ste. Genevieve, Missouri. In 1778, during the American Revolutionary War, George Rogers Clark set up a court in Cahokia, making Cahokia an independent city state even though it was part of the Province of Quebec. Cahokia officially became part of the United States by the Treaty of Paris in 1783. Soon after that, the 105 Cahokia "heads of household" pledged loyalty to the Continental Congress of the United States. Later, Cahokia was named the county seat of St. Clair County. The Cahokia Courthouse acted as a United States territorial courthouse and a major political center for the next 24 years. When in 1801 St. Clair County was enlarged, Henry Harrison named the Cahokia Courthouse the legal and governmental center of a sizeable area extending to the Canada–US border. By 1814, other counties and territories had been organized, and St. Clair County was defined as its current size. The county seat was moved to Belleville, Illinois. Cahokia is located at . According to the 2010 census, Cahokia has a total area of 9.9 square miles (25.64 km2), of which 9.4 square miles (24.35 km2) (or 94.95%) is land and 0.5 square miles (1.29 km2) (or 5.05%) is water. As of the census of 2000, there were 16,391 people, 5,693 households, and 4,252 families residing in the village. The population density was 1,705.8 people per square mile (658.5/km²). There were 6,213 housing units at an average density of 646.6 per square mile (249.6/km²). The racial makeup of the village was 58.28% African American, 38.69% White, 0.32% Native American, 0.38% Asian, 0.03% Pacific Islander, 0.73% from other races, and 1.56% from two or more races. Hispanic or Latino of any race were 2.25% of the population. There were 5,693 households out of which 41.2% had children under the age of 18 living with them, 43.2% were married couples living together, 25.7% had a female householder with no husband present, and 25.3% were non-families. 20.9% of all households were made up of individuals and 8.6% had someone living alone who was 65 years of age or older. The average household size was 2.84 and the average family size was 3.27. In the village, the population was spread out with 33.4% under the age of 18, 8.7% from 18 to 24, 29.4% from 25 to 44, 16.9% from 45 to 64, and 11.6% who were 65 years of age or older. The median age was 31 years. For every 100 females there were 88.7 males. For every 100 females age 18 and over, there were 82.5 males. The median income for a household in the village was $31,001, and the median income for a family was $35,582. Males had a median income of $31,806 versus $22,429 for females. The per capita income for the village was $14,545. About 22.8% of families and 24.9% of the population were below the poverty line, including 37.0% of those under age 18 and 5.3% of those age 65 or over. Cahokia is home to the St. Louis Downtown Airport, a general aviation facility. Cahokia, Illinois Facts for Kids. Kiddle Encyclopedia.